The new traffic flow began on 27th November. Islington Council has taken the first steps towards removing the hated Kings Cross gyratory system by returning the Caledonian Road to 2-way traffic. 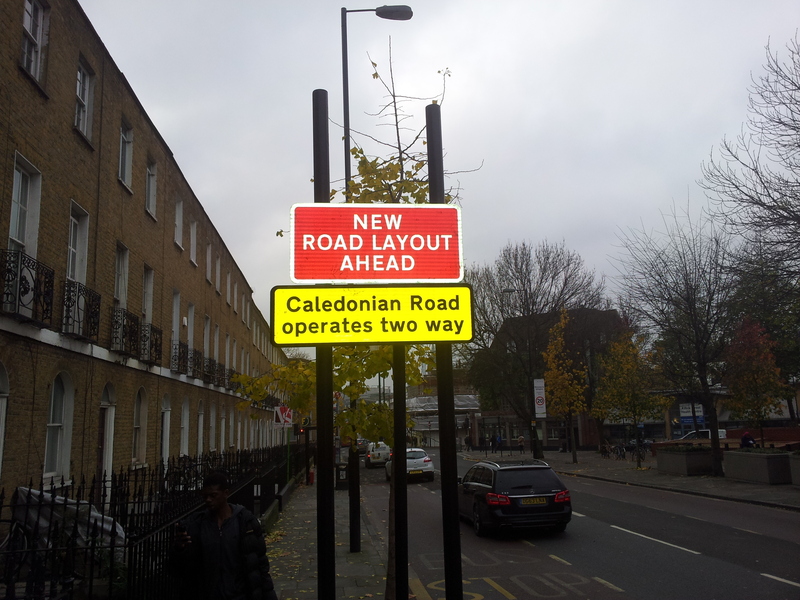 The section of road between Wharfdale Road and Caledonian Street has been re-engineered to remove the 1-way system. It was opened to new patterns of traffic earlier this week. The changes to the road layout were subject to a public consultation exercise which showed widespread support. The aim of the new road layout is to reduce traffic speeds by introducing a contraflow to what previously had been called a “three lane, one way speedtrack”. A new cycle route has been built into the Wharfdale Road – Killick Street junction. A cycle priority phase has been programmed into the signals plus a specially engineered route through the Wharfdale Road junction junction constructed for cyclists. 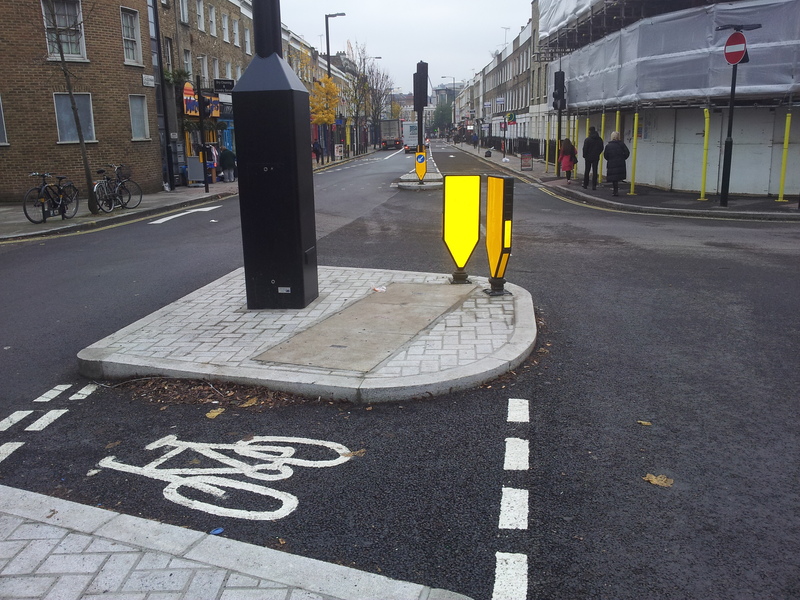 The complicated junction of Caledonian Road with Wharfdale Road and Killick Street has been rebuilt to include an additional lights-controlled pedestrian crossing. A cycle priority phase has been programmed into the signals plus a specially engineered route through the Wharfdale Road junction constructed for cyclists. By creating a through route for cyclists across Caledonian Road from Wharfdale Road to Killick Street this represents an initial phase in the construction of alternative routes for cyclists who wish to bypass the most congested and risky parts of the Kings Cross road system. Residents have expressed concerns that drivers and pedestrians may be confused by the new road layout. Numerous warning signs have been positioned to alert road users about the new configuration. Cllr Paul Convery comments “everyone living and working around Kings Cross knows that the road system and its thunderous heavy traffic blights the area. It’s a relic of the 1960s and 1970s mentality when London’s decision-takers decided to carve the most environmentally unfriendly gyratory systems out of a neighbourhood they probably thought didn’t matter. I think someone has failed to spot the fact that this has only a single yellow line. I noticed chaos last week with vehicles haveing to go into the path of oncoming traffic southbound as too many cars were parked on the single line in the new contraflow….why are there no double yellows? You’re quite right. This needs double yellow lines plus loading restriction. In 15 years I have lived at the same address on the Caledonian Road, I have never seen cars having to mount payments? There is a no stopping zone restriction in place so wonder if the cameras that prompt a £60 penalty will help stop pavement mounters to rethink their driving skills. Easy to suggests double yellow lines but think of local resident too, please. There are already loading restrictions which prohibit loading during morning and evening rush hours. Don’t forget that this is a residential as well as commercial street, we have to live and work here and don’t need any further restrictions on where and when we can park. Parked cars are a very good technique for traffic calming which as I understand it was one of the principal justifications for changing to two way traffic, so no double yellow lines thank you. Resident at 82a Caledonina Road. Not sure who this person is suggesting double yellows but I don’t agree. And besides far too early to say – people still haven’t totally acclimatised to the changes. We have put up with considerable change and the road width can handle parking so suggestion of double lines is wrong. We already have a bus lane, no stopping during peak times, what next? I recall the person I spoke at the council about the idea of making our stretch of road two way was to partly help improve retail opportunity in our part, a double yellow line and bus lane will not improve the situation. Why can’t they leave us in peace or ask us what we think? Prepared to get stuck in on the double yellow line issue, we are only asking to unload, park or wash a car on a Sunday when our road is generally quite. Initially, I approved the re-introduction of a two-way traffic scheme but realise with hindsight it is only beneficial once the KX gyratory system (Scala / Lighthouse / Grays Inn Rd etc) is fully dismantled. Until then (when?) this benefits a mere handful using the Caledonia cut through at massive inconvenience to the many drivers on Wharfdale and (southbound) Caledonian Rd road and worse, to the tormented residents of Wharfdale Road. Unless Islington can obtain an acceptable date from TFL for the end of the KX gyrator system this token one-way scheme should be abolished.